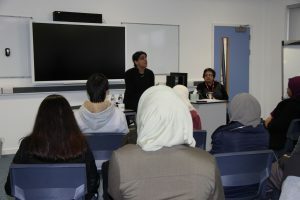 Joseph chamberlain Sixth Form College last week welcomed both Alan Rusbridger and Shabana Mamood to the College to speak to groups of students. Alan Rusbridger the Principal of Lady Margaret Hall College, University of Oxford and previous editor-in-chief of Guardian News & Media from 1995 – 2015, came into the College to talk to students on the ‘High Achievers Programme’ here at the College about applications to Lady Margaret Hall Foundation Year and the benefits this could have for JCC students. The aim of the Foundation Year is to provide teaching and support that will increase the academic confidence of students, enabling them to progress onto degree courses at top universities. The LMH Foundation Year is designed to take academically able students from under-represented groups and through a combination of academic and personal support, enable them to fulfil their potential. The students will take core modules which focus on the development of their academic writing, critical thinking and study skills in addition to personal development and their use of digital technologies. Subject specific modules will run alongside these core modules, giving the students an opportunity to experience the satisfaction of learning in an academic environment. The students found Alan’s talk really interesting and helped them gain a better understanding of becoming a rounded individual and the importance of personal development. Shabana Mahmood is MP for Birmingham Ladywood. She came in to talk to the AS and A-level government and politics students about what life as an MP is like, what the key issues are in her constituency and to answer student questions. Shabana was really impressed with the student’s questions which ranged from how she felt about the leadership of Jeremy Corbyn to the role of Parliament in Brexit negotiations, to how she juggled the work/ life balance whilst being an MP. It was a thoroughly enjoyable and enriching half hour talk that gave a good insight into the life of an MP. We would like to thank both Alan and Shabana for giving up their time to come and talk to students at the College and hope we can welcome them back to the College in the future.